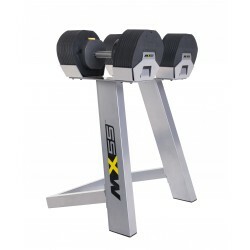 MX55 Adjustable Dumbbell Set replaces 20 single dumbbells! Almost every muscles of the body can be effectively trained with dumbbells. Unfortunately, you cannot train every muscle with the same weight. That's why you often need several weight sets to train all of them. The MX55 Adjustable Dumbbell is the remedy. Thanks to a smart adjusting mechanism, a MX55 dumbbell replace a weight set of 10 dumbbells from 4.5 to 24.9 kg! The set including two dumbbells and a weight rack is a space-efficient and affordable alternative to purchasing a dumbbell set of 20 dumbbells! The advantage of the weight system is that the weight of the dumbbell is quickly and easily changed: By a simple pressing and turning, you can add or remove weight plates and place them on the weight rack. The holder system of the weight plates, which is also patented, wedges these and avoids any noise generation. The weight stand of the adjustable dumbbell set is designed so that the taking the weights is very comfortable: The dummbells are comfortably aligned and you do not have to lift them from the floor. The dumbbells are perfectly balanced and a rolling away is avoided thanks to the smart, ergonomic shape of the dumbbell. The handle is perforated, a feature that guarantees a nonslip and safe grasping.